If you are a security company or taking responsibility for protecting premises you need to have your security signs organised to put them up in a visible place on the fence or wall of the protected site. This applies to security boards, warning signs, CCTV sign boards etc. It is a legal requirement to advise of safety measures that have to be applied on the premises. 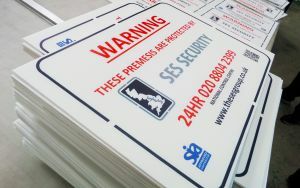 Printing bespoke security boards and site safety signs on a daily basis makes us an expert in this area. The Brexit Referendum seems to be so long ago, but the campaign is far from being over. 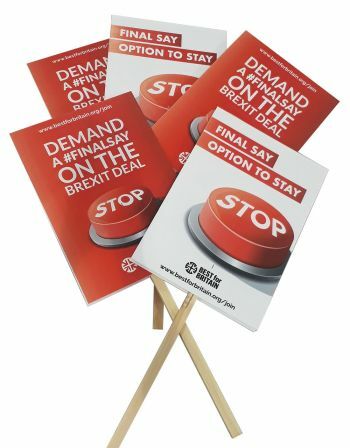 We have printed various brexit placards, predominantly anti-brexit placards for various political parties, organisations and social campaigners who 'demand a final say on the brexit deal'. On the picture you can see some examples with designs from the Best for Britain campaign. The topic is only getting hotter as time goes on, fuelled almost every day with the ongoing negotiations within the EU.